Much of the motorized equipment out there designed to aid in heavy lifting is cumbersome and bulky, and requires certifications in order to operate. This reality presents logistical and financial burdens on material handling businesses and warehouses looking to increase their workplace safety and efficiency. Depending on the equipment, total workplace safety can even be negatively impacted by new safety risks created by improper use of such equipment. In tight spaces, forklifts are the least likely to help in transporting and organizing materials, despite being some of the most common types of motorized equipment available. They’re often too bulky and ill-fitted to transport uniquely shaped materials or do so without damaging the workplace and the product. Additionally, forklifts require extra training in order to operate, as they function more like a vehicle that transports both the operator and the material. They also often present an increase in accidents and workplace injury due to a tendency for operators to drive at higher speeds. This can actually increase overhead costs as far as insurance premiums and medical payments to injured employees are concerned, while decreasing efficiency. Therefore, in tight spaces, forklifts are generally a poor investment that brings with it more safety concerns than it eliminates. The center wheel drive of motorized carts provide better maneuverability than a tugger, and don’t present the safety risks of driving forklifts. They also don’t require certifications for operation, and can be easily maneuvered with minimal training. Being smaller than a forklift, motorized carts can fit into tighter spaces with ease without damaging product or shelving. What also makes motorized carts an ideal option is their ability to be modified for transporting uniquely shaped materials like gas cylinders or somewhat hazardous equipment. 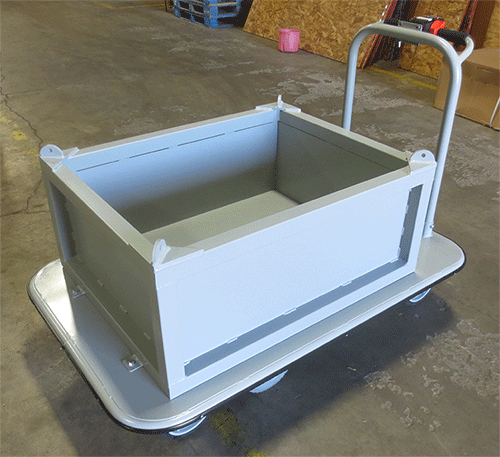 For example, we helped a large energy provider in British Columbia design and implement a custom ergonomic motorized cart for the transport of 500-pound batteries at their space-limited hydroelectric facility. 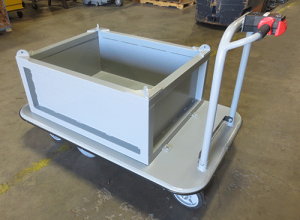 What made a custom motorized cart the ideal solution for their tight space was its ease of maneuverability, the ability to eliminate dangerous and excessive push-pull forces while lifting and moving the entire assembly, as well as the option of a custom and removable container specifically designed for safe battery transport. In that example, the investment proved to be a worthy one by reducing safety concerns and increasing efficiency, which can be especially important in a tight workspace. For more information on safe transport solutions in space-limited facilities, contact us or ask to speak directly with one of our engineers to talk through technical specifics.